You may never understand how important your Honda car key is until you misplace it. It gives you access to your car anytime, and if it’s not available, things may be a bit frustrating for you. Anyone can misplace or lose his car key, and when this happens, the right thing to do is look for a replacement. There are professionals who specialize in providing and programming key fobs. The car’s VIN is important when looking for replacement for your Honda car. This will be needed by the locksmith or car dealership before any replacement work is carried out for you. The reason for a VIN is to ascertain you are the real owner of the car. It’s simple to locate the VIN in the car. It’s located at the dashboard of the driver and still found around the rear wheel in most cars. Some cars have this number between the windshield washer and the carburetor. But some cars may not have the VIN located in these areas. If you are finding it difficult to locate your car’s VIN, you can check nit out on the insurance information of the car. Most insurance covers usually provide basic information about the car when they are providing cover for the car. So, you can check the insurance information if you can’t locate where the number is in your car. No matter which way you want to get your auto key (whether online, through a locksmith, or a car dealership), The professional needs to know the car’s model, year of manufacture, and design to ascertain which type of key is needed by the ignition. So, it’s important to provide accurate information to help the locksmith provide the right type of replacement key for the car. Car dealership tools are usually more sophisticated than a local locksmith. They are familiar with the car than most other professionals. But this option is usually more expensive than getting your key online or through a local locksmith. If you misplace a key fob, a better option for replacement will be at a car dealership. They make use of sophisticated machines to program the fob and synchronize it with the car’s ignition. There are cheaper after market options for your key fob can get that match the specification of your car. Generally, older vehicles are easier to find their replacement keys compared to newer vehicles. As with any thing with aftermarket value, it is riskier to buy an aftermarket products. This is because you still need to program most keys from Amazon or EBay. Any other service on the key has to be done by a locksmith. So the actual cost you pay for the replacement may increased potentially if you decide to order an aftermarket replacement key. Depending on your situation and car model, ordering your key fob at Bobcat Locksmith seems to be the best option. This is not just because of the cost but the time factor. The fastest way to get a replacement is to order from your local locksmith. It might take just some few hours to get the replacement key ready for use, unlike with a dealership or online order that takes days to receive. But if you have time to spare and can wait for the right replacement key to be made, a dealership is also a great option. Some locksmiths may not have the exact key replacement for your car. But a dealership should have all types of car key replacements. If you cannot find your key at a locksmith, the only other option is to find a dealership. They should have the specific key replacement for your car, but at higher cost. If you have the latest car model and lost the key, you should first find out whether the car’s warrant provides cover for a replacement key. The dealership might provide some form of discount if the replacement if the warranty still covers it. This situation is not possible in all case, but it’s good to first verify if there is any form of key replacement warranty on your cart key before calling a locksmith to do the job. 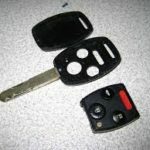 Should I replace a malfunctioning key fob? Do not move immediately to replace your car key unless you are sure the key is no longer useful. Once you are able to deal with the problem, the key will resume its normal service without any issues. A key fob can malfunction during extreme weather condition or if water soaks it. If you recently repaired or changed your car’s electric system, this may affect the proper functioning of the key fob. Most Honda car fobs usually come with a battery. If your key does not perform properly, the problem may be from the battery. The replacement battery for Honda key fob models is cheap. You can purchase them at online shopping malls such as EBay and Amazon. The car dealer can also provide a replacement battery to your specific car model. Again, you need to provide the model, make, and age of the car before you contact the dealership. 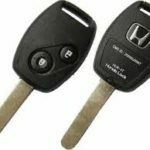 What does it cost for Honda replacement key? 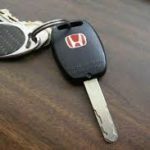 The different Honda models have their different replacement keys, which mean their cost will be different too. For instance, the cost of Honda NSX key will be different form the cost of Honda Civic key. So, the cost of replacement may vary according to the model of the car. However, you should be expected to pay anywhere form $120 to $300 for Honda replacement key. There are some other factors that can determine how high you can pay for Honda replacement key. If the professional is carrying out other services apart from replacing the car’s key, the cost will definitely increase. For a fob key or a key with transponder, the cost is usually higher because of the programming of the fob. Generally, making a car key shouldnt take more than 3 days at dealership. But if you are calling the service of your local locksmith, the time frame will even be lesser. Some basic key replacements can last for less than one hour. However, if the replacement requires programming of the fob key, the job will need more time because is involves a technical process. With three replacement options available (through a locksmith, a car dealership, or online mall), you can make the best choice for the shortest possible time. Most new model cars usually have remote to vital sections of the car. A locksmith can program your car keys and provide new remote for the car in case you’ve lost the original. It functions as a car key since you can use it to open the door and turn on the ignition. But the remote replacement is usually more expensive because the locksmith has to program the remote to be acceptable by the car’s ignition. If your car ignition cylinder has a problem, the best option is to seek for a replacement. If your vehicle’s car key does not start the car but opens the door, there may be a problem with the ignition. The car cylinder might depreciate overtime, so this is not a rare problem. Locksmiths can help you easily fix this problem by replacing it with a matching ignition cylinder. Most recently manufactured Honda cars make use of a key fob instead of a standard Honda key. This is quite unique and different from a basic car key. It comes with a push button ignition, which means you don’t need to turn the key before starting the car. It doesn’t come with an ignition cylinder, so you don’t have to worry about replacing any ignition cylinder. But you have to deal with the high cost of replacing the fob key. Fob key replacements are usually more expensive because the locksmiths have to reprogram the key to make it acceptable by the ignition. Most car key locksmiths have the required machine to effectively replace your car’s fob key. You can save some cash if you opt for replacements with a locksmith rather than calling a car dealership.